Sooryansh, a photo by Linisha on Flickr. 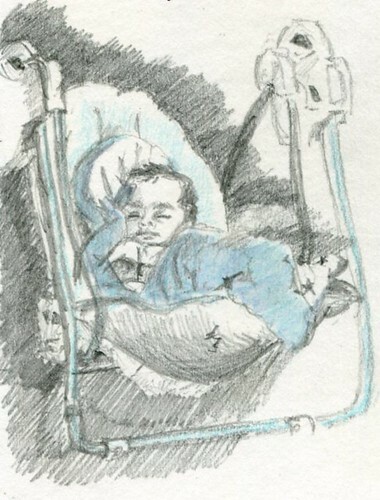 .. asleep in his swing.. That was a few months ago.. Now he won't doze off in it! You've posted some lovely drawings this month. I think this and the view outside are my favourites. Thank you so much Sue.. for your very kind words.. I am so sorry, though I visit your pages, I usually end up finding time just to read through them and admire your sketches..